Today (12th March) is the last day of British Pie week and a pie related post seemed in order. 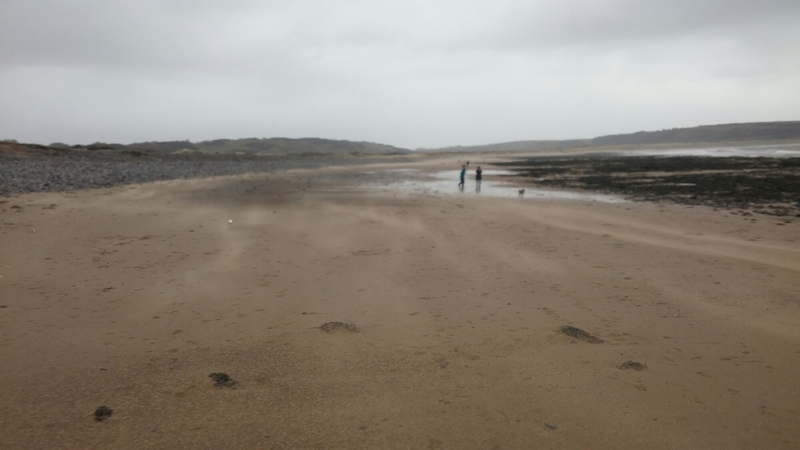 I am rather partial to a good pie and a Sunday lunch out with family and friends, over for the weekend, following a very bracing walk on the beach, presented an ideal opportunity to kick off British Pie Week a day early. I choose the Bush Inn at St. Hilary as the venue for lunch as it is about half way between Cardiff and our chosen walk on Newton Beach, offers food quite late into the afternoon (until 16.00 on a Sunday) and most importantly (said walk on the beach was to exercise our respective dogs and to blow away the cobwebs after a rather late and drunken night) is resolutely dog friendly. It also has a rather fine sounding selection of pies on its menu according to its website. So in theory all boxes neatly ticked. This brings me to the thorny and vexed question of what actually amounts to a pie. I tend to side with the purist position taken by the British Pie Awards in their admission rules, which state that the only thing that qualify as a pie is ‘a filling totally and wholly encased by pastry’. So all potato topped “pies” are not pies and nor is a dish full of filling with merely a pastry lid, but arguably a Cornish pasty is therefore a pie, as is a samosa and, rather oddly, a spring roll. Hmmm – does seem odd that a pastry lidded pie doesn’t qualify, but a spring roll (in theory) does. Always going to be anomalies I suppose. Personally I can see an argument that a “sealed” pastry cover over a filling in a dish is a pie. Then again wouldn’t that make a traditional biryani (with the rice cooking under a pastry lid) a pie and that can’t be right. It is actually a bit of a minefield!! Taking out obvious anomalies like spring rolls, I think the National Pie Awards view of what qualifies as a pie is pretty sound. 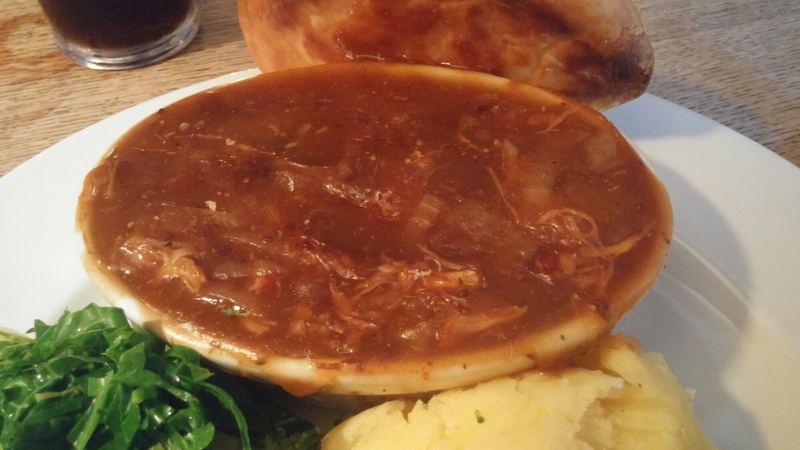 As for the Bush Inn’s pies read on to see if they qualify as a pie. 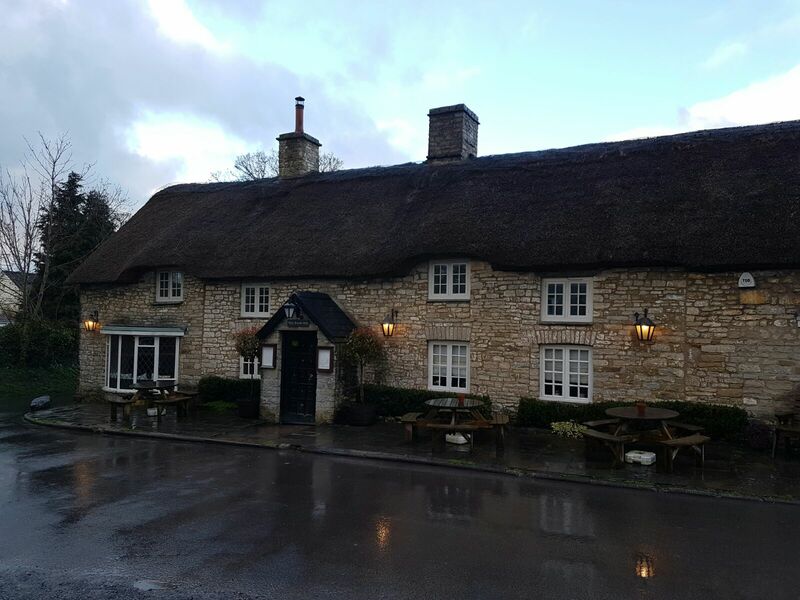 Located in the rather lovely village of St Hilary in the Vale of Glamorgan, the Bush Inn looks from the outside to be a quintessential British pub. 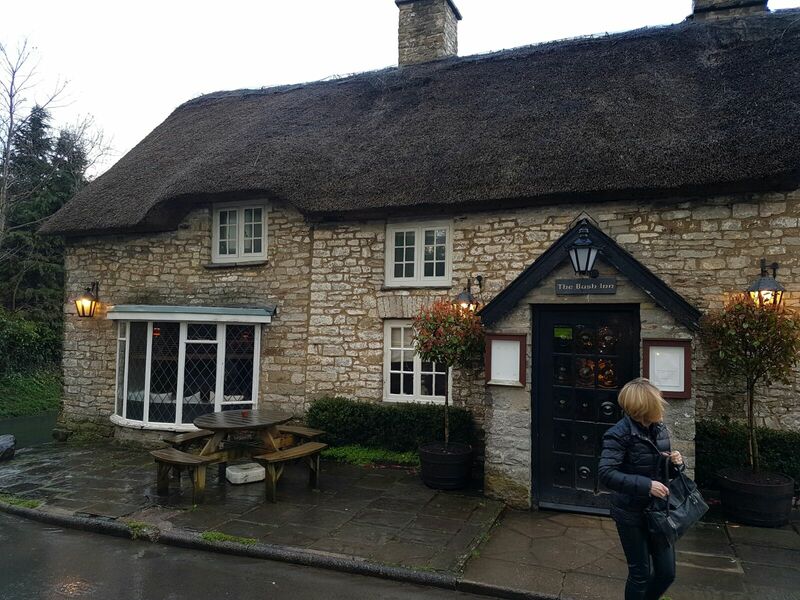 Picture postcard, with its thatched roof, it is what I imagine most Americans think all UK pubs look like. 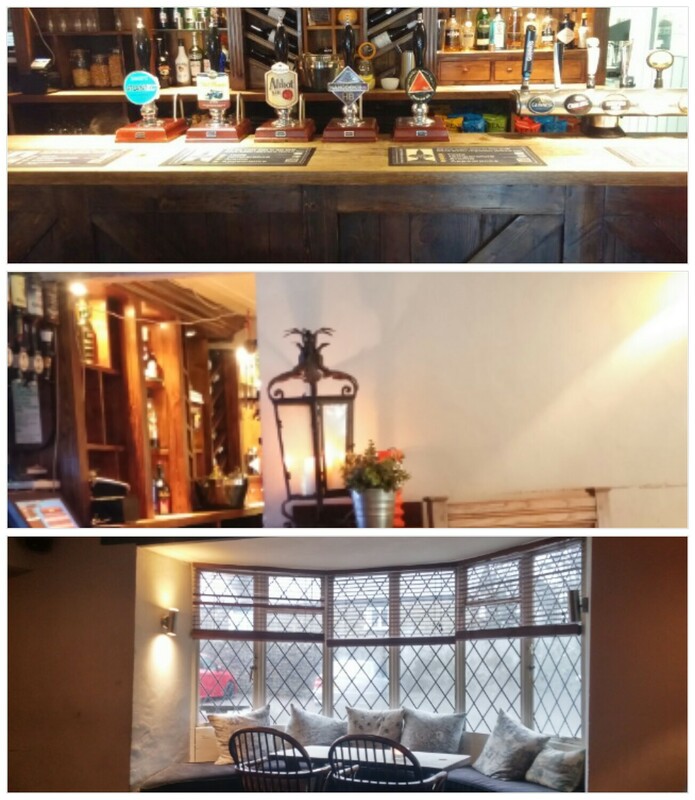 Inside it is a hotch potch of rooms in the form of the bar, a snug and a restaurant area all with thick stone walls and flagstone floors tick all the traditional pub boxes. Very pleasant, with the added benefit, for me as a dog owner, of being very dog friendly. Something for everyone from a light snack to a full blown 3 course meal. 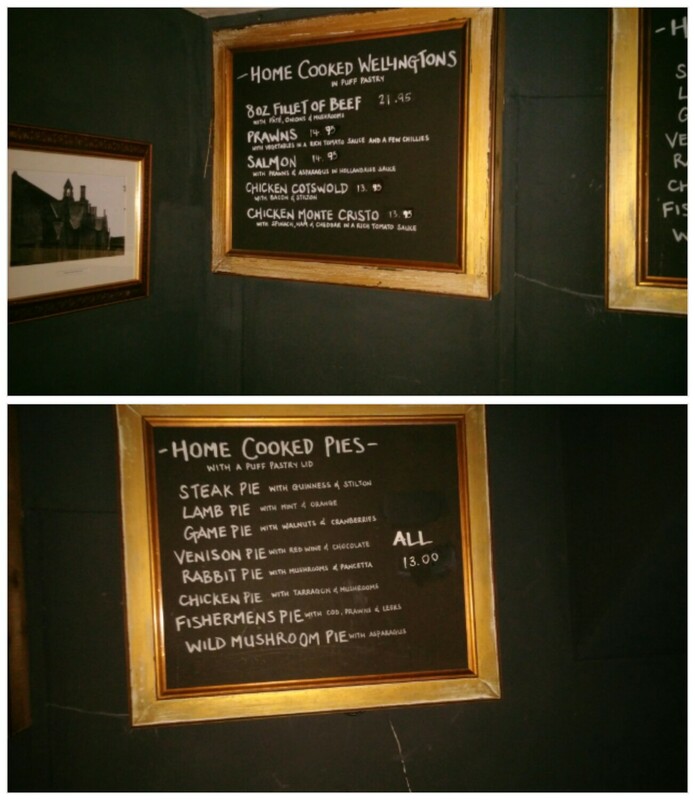 On the walls, boards display an electic mix of “pies” (all £13) and Wellingtons (ranging from £13.95 to £21.95 – the latter for the traditional “Beef Wellington”). Rather oddly, at least to me, the “Wellingtons”included a prawn one. 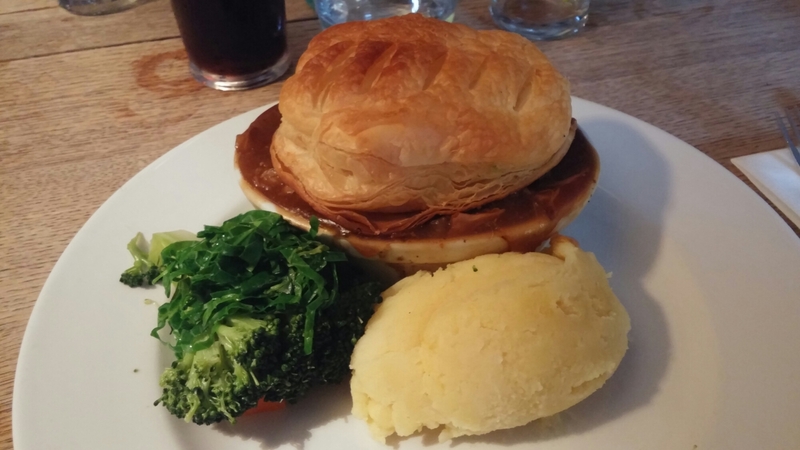 After a good bracing walk and feeling a bit fragile as a result of the night before, I fancied a bit of comfort food and food doesn’t come more comforting that a piping hot meat pie. 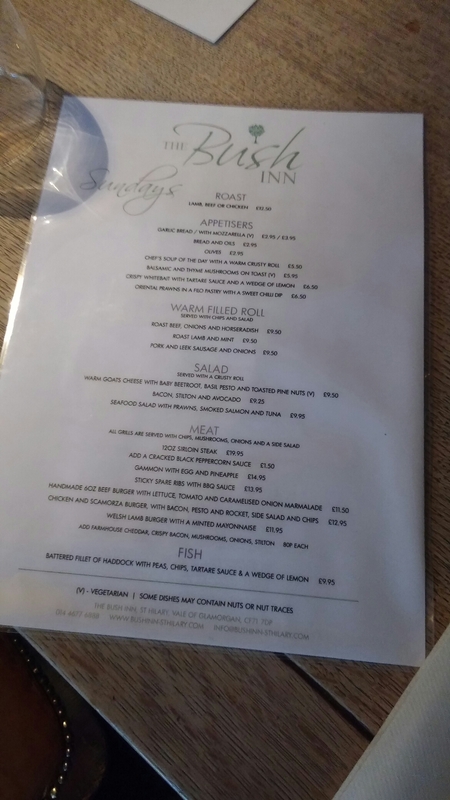 A nice and interesting selection on offer at the Bush Inn in terms of fillings (meat, fish and veggie) made my mind up ( although I had slight misgivings at the reference to a puff pastry lid) . Whilst tempted by the beef and stilton and the venison and chocolate ones, I eventually plumped for the rabbit with pancetta and mushroom. 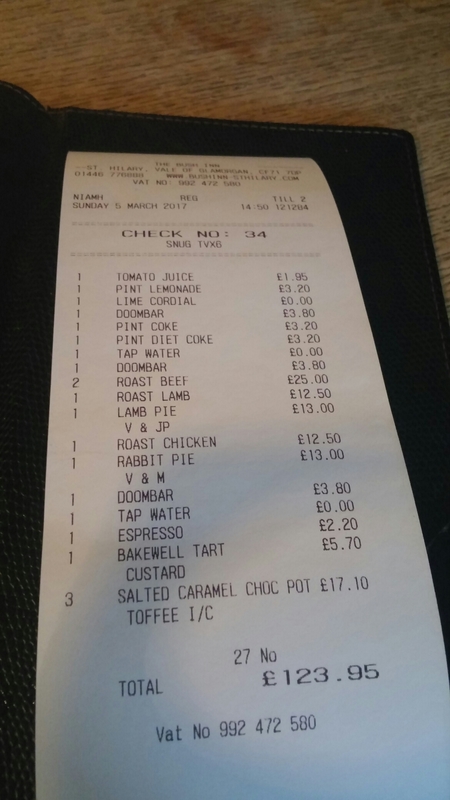 This came with the options of veg or salad (salad with a pie – don’t think so) and chips, new potatoes, jacket or mash. To me it has always got to be pie and mash. It was not encased in pastry nor was the pastry lid affixed to the pie dish the filling came in. The lid was a puff pastry block (very nice – flaky and buttery), which simply floated atop the filling and was easily removed intact. It appeared to have been cooked separately to the filling and plonked on top as part of an assembly exercise. Whilst clearly (in my opinion) not a pie, what it was was a very tasty rabbit stew/casserole with a puff pastry block on top. Piping hot with a very generous filling, it had lots of rabbit (more mushroom and pancetta and less onion would have been nice) and was properly seasoned. In short, a lovely bit of comfort food (but not a pie). The accompanying mash was lump free and properly seasoned. Other veg that came with the dish (cabbage, carrots and broccoli) was not over cooked, but needed a grind of salt and pepper to pep it up. Great food to fuel up on after the rather arduous beach walk on which we all got a good sand blasting. One other of our party ordered a “pie”, in the form of a lamb, mint and orange number. This was, as per mine, generously filled and tasty. Tender lamb and lots of mint flavour, the orange didn’t really come through. Notwithstanding the lack of the advertised orange, this was pronounced a very pleasant. 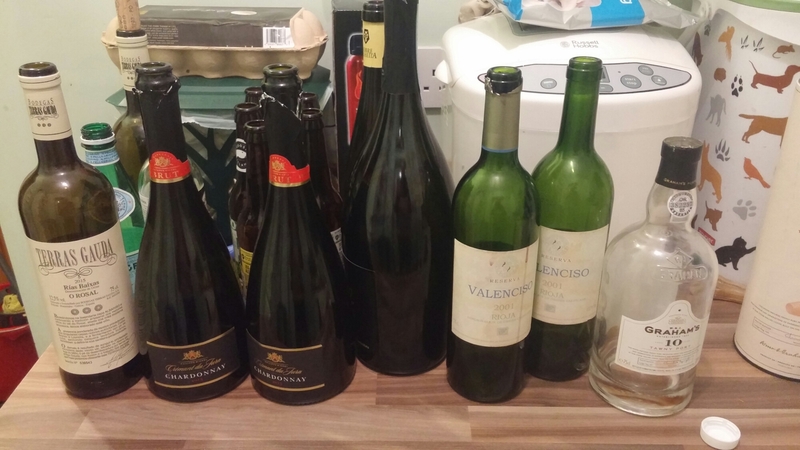 The remainder of our party went for the Sunday roast (£12 50), covering all bases by going for chicken, lamb and beef. All were pronounced as very nice. 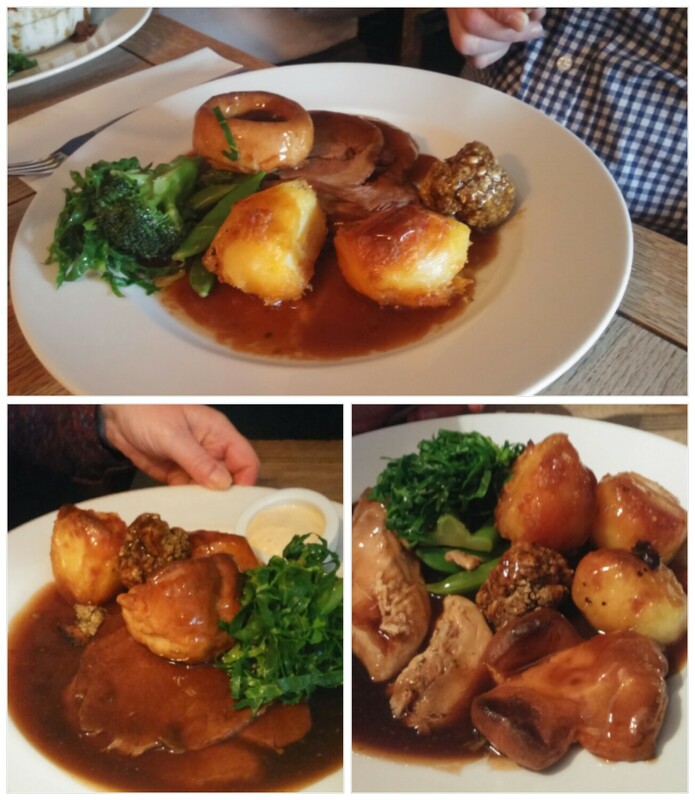 Good quality meat, crispy roast spuds and nicely cooked veg. all topped off with a very pleasant gravy. The only slight downside was both the lamb and beef were cooked a bit over for our party’s blood thirsty tastes. The beef was pink (we all prefer it ruby red) and the lamb had not even a hint of pink, which was a shame. 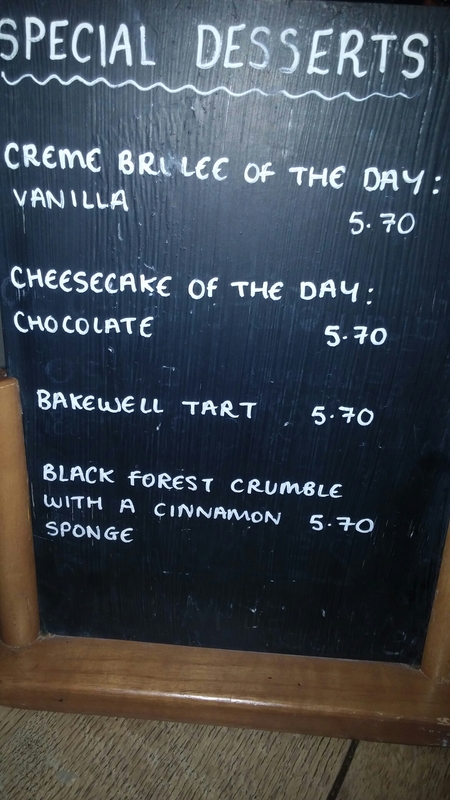 On the pudding front, they have a varied mix on offer of most people’s favourites (creme brulee, stickie toffee pudding, chocolate pots and Bakewell tarts to name but a few). 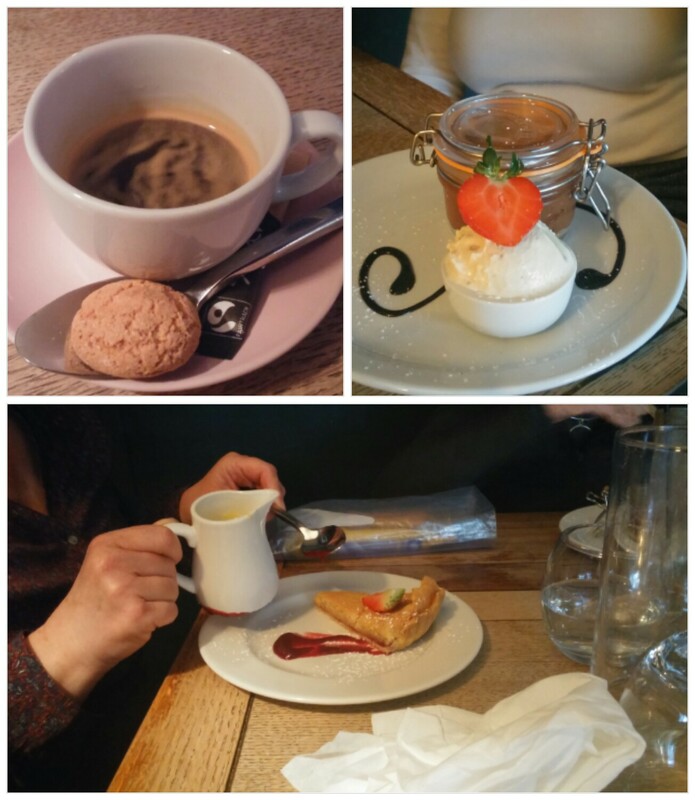 Both desserts went down well, with a very acceptable Bakewell tart being the standout (the chocolate pot was very nice, but a bit rich for me from the small taste I was given). 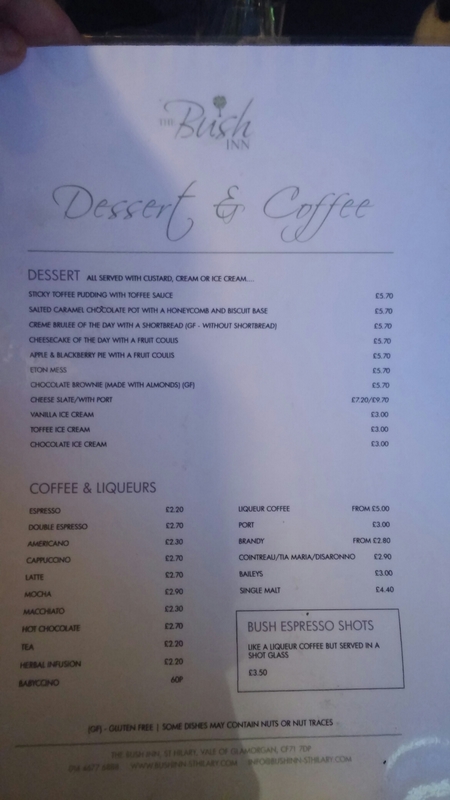 Rather curiously we were asked if we would like custard, cream or ice cream with both the Bakewell and the chocolate pot. Does anyone really want to add hot custard to a chocolate pot?! Those having the chocolate pot sensible passed on the custard option and went for ice cream in the form of a very pleasing toffee/honeycomb number. On the drinks front, 2 of us were driving and some (including me) were still feeling a bit fragile from the night before when we all drunk a bit too much. It was therefore soft drinks all round, bar from the two hardy souls. An ok, if not particularly inspiring, selection ( usual sodas, J2O and a few juices) was on offer. 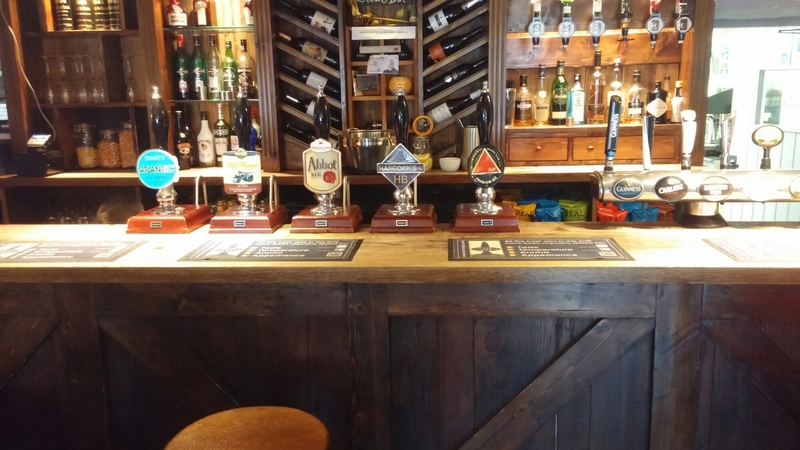 Personally I think it is a shame they didn’t have a few more local (Vale or Cardiff) brewed beer on draft rather than somewhat dreary Bass and Greene King. On the wine front, there is much more of interest. If I hadn’t been driving, I would have definitely gone down the wine, rather than beer, route here. I think the Smart Dog syrah (rather apt for a doggy friendly pub) on the list (from the somewhat underrated and under represented, in the UK, Alentejo region of Portugal ) would have worked quite well with my rabbit pie. Not too hideous a mark up with it being priced here at £23.95 as against a retail price of about a tenner (seen a hell of a lot worse mark up recently). 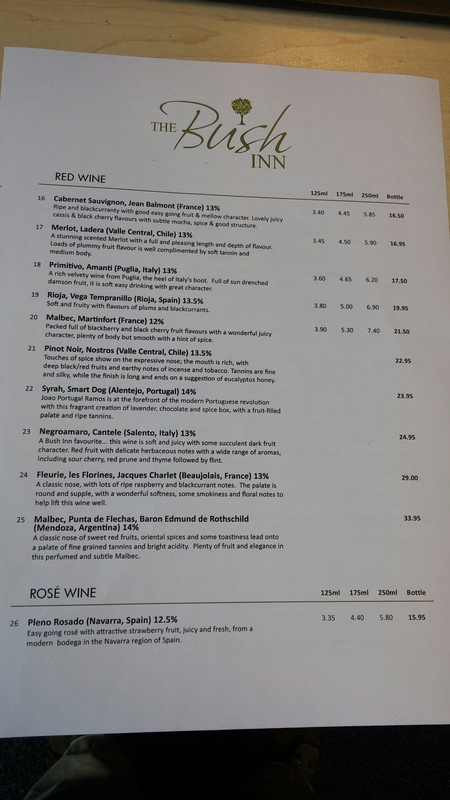 Mark ups elsewhere can be a touch higher, with the Punta de Flechas Malbec being £33.95 (whereas I can get it retail for £13.95). 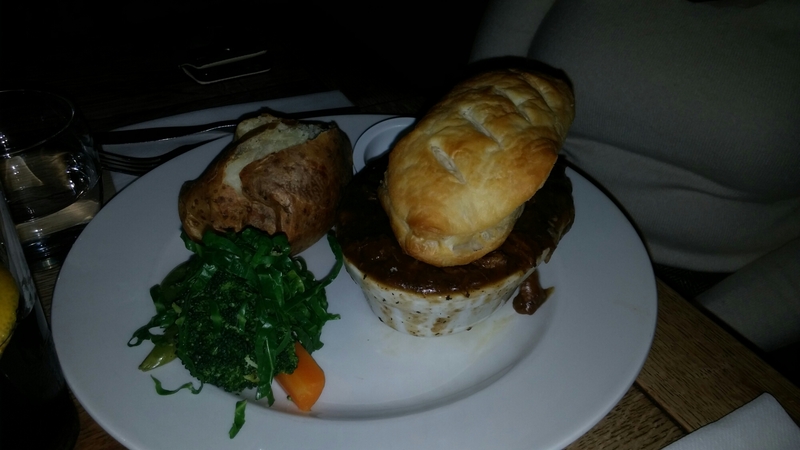 I rather enjoyed my “was it or wasn’t it a pie” meal at the Bush Inn. Good hearty comfort food that is great after a walk. They even have details in the pub of a number of circular walk that look good for working up an appetite. Would I go back? 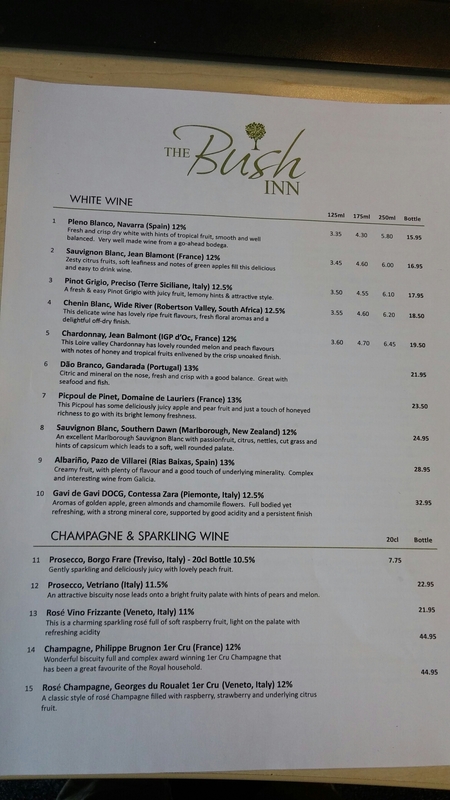 Yes, nice pub in the Vale with good food. Great after a nice walk on the beach or in the countryside. I do, however, wish their beer offering was a bit more adventurous. Finally, was it a pie? Nope – definitely not, even if you apply a liberal definition of the term so as to include ones with only a sealed pastry lid. Perversely the Wellingtons on offer are, based on the “filling fully encased in pastry” definition, pies. I rather enjoyed mine, whatever it was. Llantrihyd Road, St. Hilary, Vale of Glamorgan, CF71 7DP. 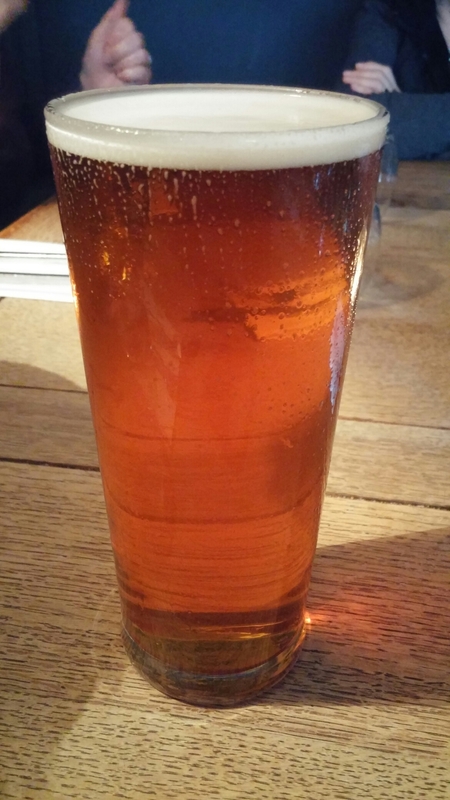 This entry was posted on Mar 12, 2017 by solicitingflavours in Alcoholic drink, Australian wine, Beer, bitter, British Pie Week, coffee, Country pub, dog friendly, Drink, Food, Food and wine products, French wine, lamb, lunch, lunchtime, Non alcoholic drink, Pie, Pies, Pub, pub lunch, Real ale, Red Wine, retail, Ribera del Duero, Sunday lunch, Sunday roast, syrah, the Bush Inn, Uncategorized, Vale of Glamorgan, Wales, wine pairings.